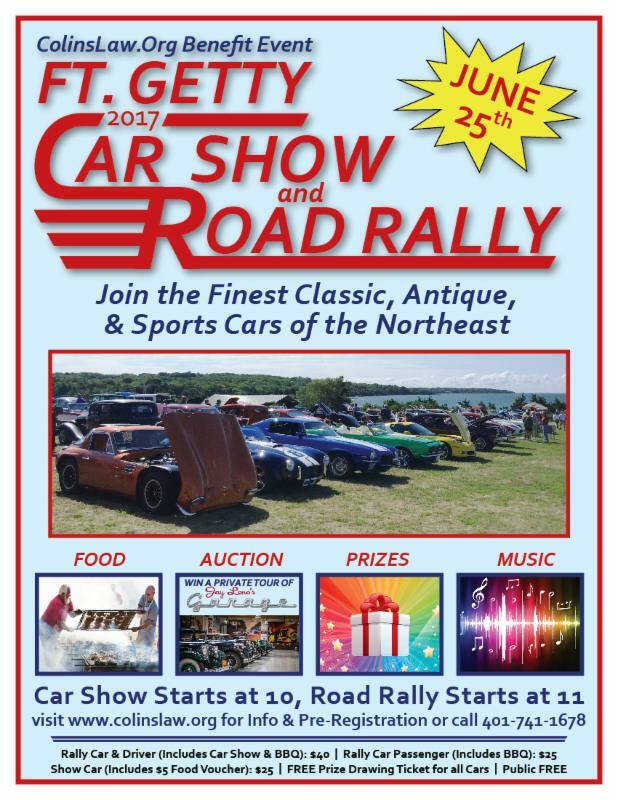 Please join us for our 2017 Ft. Getty Car Show & Road Rally on Sunday, June 25th in picturesque Jamestown, Rhode Island! This inaugural event is to benefit our nonprofit, ColinsLaw.org, dedicated to making our roadways safer for everyone! We expect up to 200 cars to participate in this event. More than your average Car Show, we have added a Road Rally Course for 30-50 cars, including some exotic classics. This is not to be missed! After the Rally, guests will enjoy a catered Chicken BBQ at the Ft. Getty Pavilion and have the opportunity to win some amazing raffle items, including a stay at the famous Castle Hill Inn valued at $1,500! In addition, bragging rights will accompany a handsome trophy to the car that receives the most “People’s Choice” votes for favorite car. Entertainer/television personality and car enthusiast Jay Leno personally donated a private tour for 4 people at his famous Big Dog Garage in Burbank, CA. 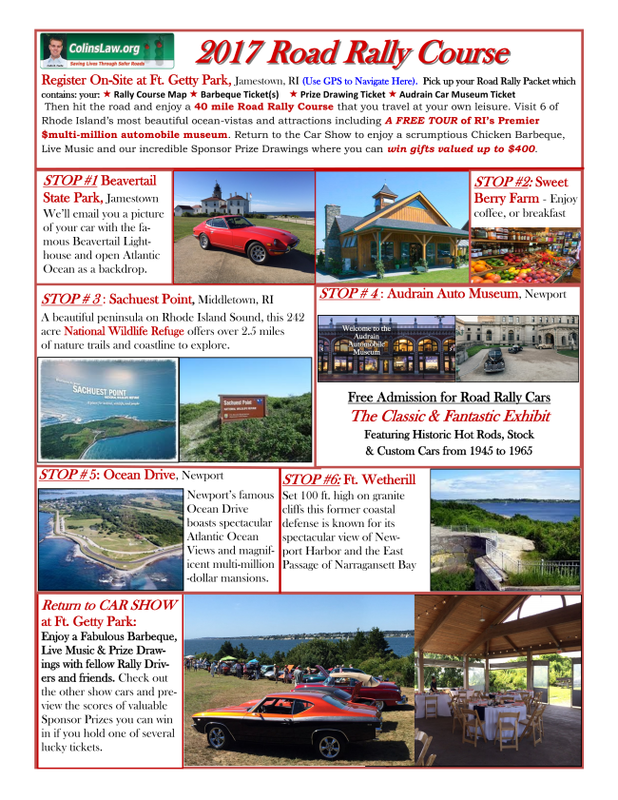 There’s still time to bid by visiting www.ColinsLaw.org! We will announce the winner of this very special auction, which closes at 3 PM on June 25th, during the event. All registrations for Rally Cars MUST take place by Tuesday, June 20th. Show Cars may register upon arrival to event. Register here or by visiting www.ColinsLaw.org. We established ColinsLaw.Org “Saving Lives Through Safer Roads” in the memory and honor of our son, Colin Foote, who was killed in 2010 by a drug addict with 19 prior traffic convictions who ran a red light, and killed him while crossing the intersection on his restored 1975 Honda 500T motorcycle. Our organization has been successful in having legislation passed to remove dangerous Habitual/Repeat Offenders from our roads and installing life-saving intersection technology. We hope you’ll support this worthy cause! Maryann and I look forward to seeing you there.